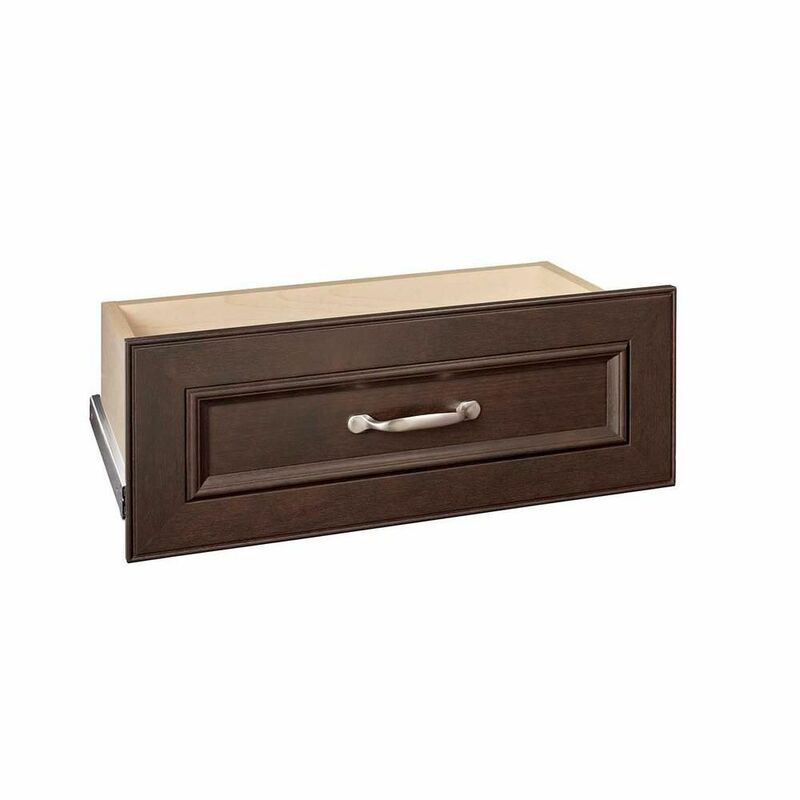 The ClosetMaid Impressions Drawer Kit features a premium, embossed chocolate finish with a decorative panel front. The full-extension, ball-bearing operation offers you smooth gliding and easy access to clothing. This drawer kit is designed to work with the ClosetMaid Impressions 25in. 4-Shelf Organizer or Impressions 25 in. Standard Closet Kit (both sold separately). ClosetMaid Impressions 25 in. Chocolate Standard Drawer Kit The ClosetMaid Impressions Drawer Kit features a premium, embossed chocolate finish with a decorative panel front. The full-extension, ball-bearing operation offers you smooth gliding and easy access to clothing. This drawer kit is designed to work with the ClosetMaid Impressions 25in. 4-Shelf Organizer or Impressions 25 in. Standard Closet Kit (both sold separately). ClosetMaid Impressions 25 in. Chocolate Standard Drawer Kit is rated 3.8 out of 5 by 31. Rated 4 out of 5 by Volkom from Quality is better than the actual cabinets they go in... Quality is better than the actual cabinets they go in to. Rated 2 out of 5 by Ciera from Easy to assemble, but didn’t fit. Had to rig it... Easy to assemble, but didn’t fit. Had to rig it with my own stuff to make it stay on the tracks! Rated 1 out of 5 by El from Pretty but not well made I ordered these drawers for my daughters closet. They don’t open correctly. It’s hard to shut as the glider digs into the wood on the side. We ordered additional drawers and it contained the wrong parts. The glider is too long. Now I need to contact closet maid and have them send me the right part. So disappoined. Rated 3 out of 5 by Ethan from Good solid product. Drawer sizes could be a little more flexible. Also the brown laminate is ding... Good solid product. Drawer sizes could be a little more flexible. Also the brown laminate is dinged up in a few places. should include a brown touch up pen for the dings.